Britton Buchanan sang “Dancing on My Own” and received the Instant Save during The Voice‘s semifinals. After Buchanan was saved from elimination, he became a season 14 finalist. He recorded music with John Davenport, an engineer who released “Riptide” by Robert Palmer and “Born in the U.S.A.” by Bruce Springsteen. Britton Buchanan is on Team Alicia. His sound is a signature blend of pop and adult contemporary music. Spensha Baker sang “My Church” during The Voice‘s semifinals. Spensha Baker is a singer on Team Blake, and her music combines elements of country and gospel. When Baker was 12, Interscope Records released her first gospel album. Now, Spensha Baker sings country music while incorporating her signature sound and stage presence. Brynn Cartelli sang “What the World Needs Now” during The Voice‘s semifinals. Brynn Cartelli is a singer on Team Kelly, and she has a strong stage presence. Her music fuses pop and adult contemporary. At age 6, Cartelli became an established singer by participating in school talent and variety shows. In addition to music, she plays lacrosse and has a busy school schedule. She is the youngest finalist in The Voice history. 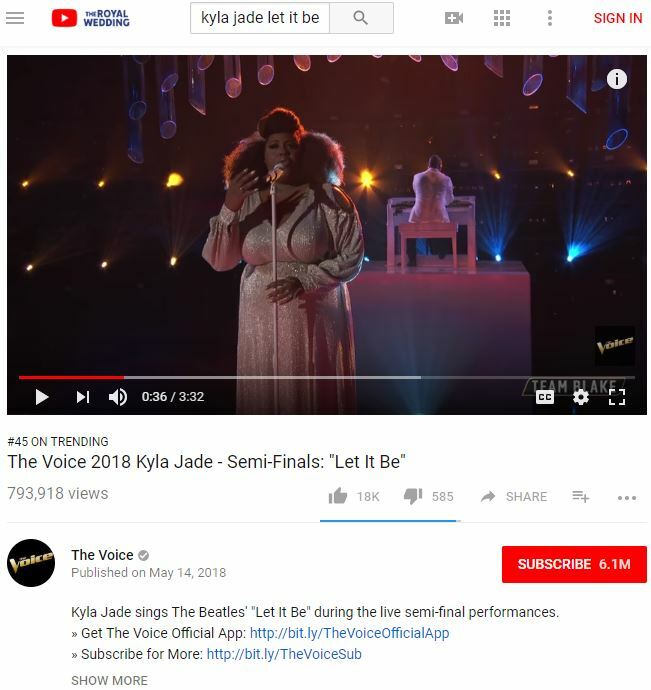 Kyla Jade sang “Let it Be” and received the public’s vote during The Voice‘s semifinals. This video landed in the Top 50 of YouTube Trending. On May 19, it reached #45 on YouTube’s trending list. Kyla Jade is on Team Blake, and her music blends gospel with R&B and soul. A powerhouse vocalist, she sang backup vocals for Jennifer Hudson. NBC’s The Voice will air its season 14 finale on May 21 at 8/7c, and May 22 at 9/8c. Brynn Cartelli will sing with Julia Michaels on Tuesday, May 22. Click here to see the tweet. On May 22, The Voice will announce its new winner. Public voting will close on May 22 at 12pm ET. People may vote online or on The Voice‘s app. Click here for more information. Did you miss the season 14 semifinals? Click here to watch The Voice episodes.